James Craven scored Thornhill's first try against Upton. Thornhill Trojans kicked off their new Pennine League winter campaign with a 32-30 victory away to Upton. Despite what the final score line might suggest, this was far from a close game as the Trojans dominated for a large part and built up a 32-6 lead early in the second half. It was only when Thornhill thought that the game was won and switched off that Upton began to fight back. The Trojans gave a debut to prop forward Jonathan Hellings, who has transferred from Mirfield Stags, and he impressed in his first outing with some no nonsense running and collected the man-of-the-match award. Upton opened the scoring with a quick try and a goal but then it was all Thornhill as the visitors built up a healthy lead. Captain James Craven was impressive at half-back and used a sudden burst of pace to score Thornhill’s first try. Craven received the ball from a scrum, dropped his shoulder and set off to sprint clear for a try which Mark Hodgson converted. A couple of minutes later Thornhill were once again on the try trail when Josh Lister went on a stepping run towards the line. Upton couldn’t stop Lister’s forward momentum and the try was scored. Hodgson converted. Jordan Truelove then did well to collect a high kick and power over for an unconverted try in the corner. Still Thornhill pressed forward and winger Sam Ratcliffe went on a wonderful run to make good ground. The ball was then worked along the attacking line and Luke Carter took possession, sold a wonderful dummy and a gap appeared for him to nip through and go over for a try which Hodgson converted. By now Thornhill looked invincible and the ball was shipped along the attacking line to put Chris Mitchell over for an unconverted try in the corner. Thornhill came out for the second half looking in control at 26-6 but when tempers began to boil over following a few niggles in the tackle, the Trojans seemed to lose their composure. Despite this loss of shape, the visitors did manage one final score through Jordan Truelove. Hodgson converted. Suddenly the tide changed as Upton took control to score four converted tries without reply, including a brilliant 80 metre interception effort. This cut Thornhill’s lead to two points and it was only Upton running out of time that really saved the Trojans. 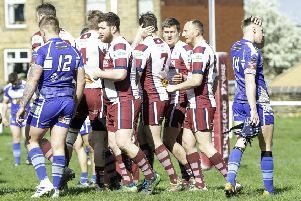 When the full-time whistle went the Thornhill players needed to check the final score line for reassurance that they hadn’t let the game slip through their fingers.